2 Watt Laser Cutter and Engraver Project Part 5 – Building the X Gantry! 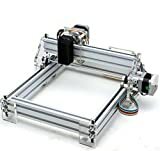 In this episode we will add the X Gantry we designed for the 2 watt laser cutter and engraver build project. As the build mature we will place all of the additional STLs up on Thingiverse as well build up an additional BOM (Bill of Materials) for the project too! So stay turned and see how the build turns out! Also if your interested in jump starting your build of a similar device, check out the link below! ← Use 608ZZ Skate Bearings for V-Slot Wheels and Save!